THE LARIMER LTRG CASE MANAGEMENT IS NOW CLOSED. OUR TEAM IS WRAPPING UP OUR VOLUNTEER OPERATIONS FALL 2017. Everyone's flood or High Park Fire story is as unique as their recovery needs. The LTRG, utilizing skilled case managers, identifies and assists households affected by the disaster who do not have adequate personal resources for basic needs and recovery. Our trained disaster case managers are here to listen, and to help create a personal action plan to guide your family towards recovery. Even more than a year after the floods and two years after the High Park Fire. . . new resources are now available for primary residents in Larimer County. Your case manager will help navigate the best resources to make that long-term road to recovery a little smoother. Here are a few examples of what your disaster case manager can do for you . . . 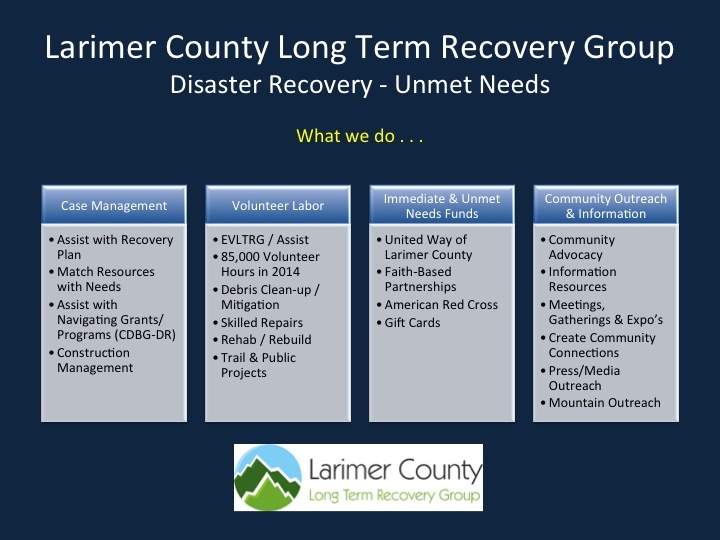 The Larimer County Long-Term Recovery Unmet Needs Fund is administered by Long-Term Recovery Group of Northern Colorado (LTRG-NoCo), which is made up of more than 30 nonprofit agencies, government organizations, faith-based groups and concerned citizens. The Fund will be used specifically for long-term recovery needs of Larimer County residents affected by the 2013 Colorado floods. United Way of Larimer County is serving as the fiscal agent for the Fund. A separate unmet needs fund has been in place since 2012 for the High Park Fire and was also being managed by the United Way of Larimer County. Requests for funding must go through our disaster case management process. To be eligible for assistance, residents must have suffered losses due to the floods or High Park Fire in Larimer County. Residents must meet with the LTRG disaster case managers, who will assess situations, identify resources, and refer residents to possible sources of assistance, including funds available from the LTRG. Restrictions and qualifications may vary between flood and fire programs. Discuss your specific situation with a case manager for more details. The LTRG is governed by an Executive Committee made up of community leaders.